To sign in to the MakeShift app for the first time, you need to create a password. This can be done from the welcome email that was sent to you when your employer signed you up for MakeShift. If you have not received this email, please speak with your employer to check that they have your correct email address on file. Check your email inbox for your MakeShift welcome email on your iOS device. 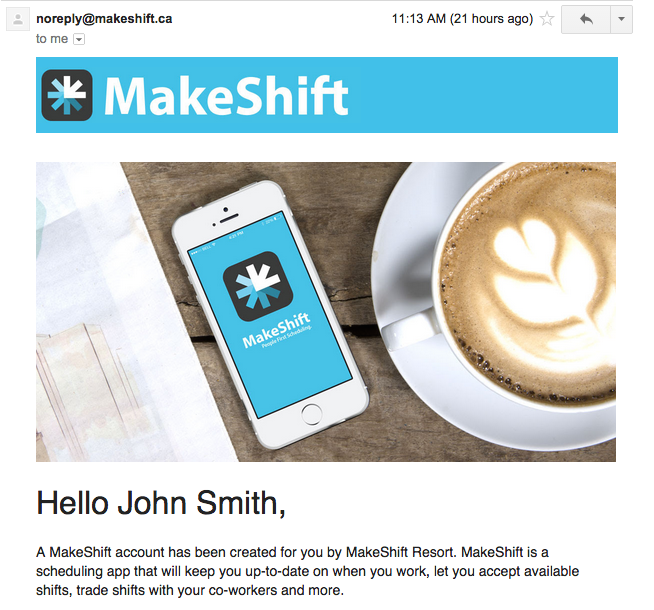 It will be sent from noreply@makeshift.ca with the subject line (name of company) has invited you to MakeShift. Click the Activate Account button to direct you to a page where you can set your password. Next, the page will ask you to Continue to Web. You can choose to view your schedule on the computer, or download the iOS/Android app on your smartphone. Login for the first time using your email and new password. You can now see your scheduled shifts and access features that you can use to set your availability, request time off and exchange shifts with coworkers.